As you well know if you’ve read my Steve Jobs biography thoroughly, Steve Jobs was not CEO of Apple until January 2000. Apple’s first CEO was in fact Michael Scott, more famously known as Scotty. Scotty notoriously didn’t get along well with Steve in the early days (as most employees, to be honest), and his eventual departure of the company in 1981 gave Steve Jobs the necessary power to take over the Macintosh project. In a fashion that was probably launched by John Sculley, BusinessInsider published an interview of Scotty last month, which is worth a read if you are interested in Apple history and have 15 minutes to spare. The piece is honest, though pretty light on the real reasons of Mike Scott’s departure, namely the lay-offs of Black Wednesday. BI: What were your impressions on meeting [Steve Jobs and Steve Wozniak]? MS: I never got to see the garage, I just saw it at Markkula’s place up on a hill. Jobs did the talking, and Woz was the quiet one, although more lately Woz has found his voice more. In the early days, we were all so busy, that it was well partitioned over who did what. Woz was doing circuit board itself, Jobs was handling rest of Apple II, Markkula was working on marketing, and I was working on getting us into the manufacturing and all the rest of the business parts. BI: Was [Steve Jobs] as particular then as he is said to be now, or in the early days was he learning and acting differently? MS: No, he was maybe more particular. The Apple II case came, it had a beige and a green, so for all the standard colors of beige available in the world, of which there are thousands, none was exactly proper for him. So we actually had to create “Apple beige” and get that registered. I stayed out of it but for weeks, maybe almost six weeks, the original Apple II case, Jobs wanted a rounded edge on it so it didn’t have a hard feel. They spent weeks and weeks arguing exactly how rounded it would be. So that attention to detail is what Steve is known for, but it also is his weakness because he pays attention to the detail of the product, but not to the people. BI: Can you explain that? So was that your job to make sure you brought in all the right people and he wasn’t very attuned to that? MS: I don’t know how much he’s changed being a manager, but he would not, for instance! he was never allowed to have much of a staff while he was there because he would not supervise them. He wouldn’t make sure they got their reviews on time or that they got their raises, or that they got the health they need.You have to take care of the people as well as the product. As they say he yells at people, at times you have to yell, but at times you have to be supportive too, and I would say that that’s still what makes Steve, Steve. That was a dispute you get into — who gets number 1? One of the first things was that of course, each Steve wanted number 1. I know I didn’t give it to Jobs because I thought that would be too much. I don’t remember if it was Woz or Marrkula that got number 1, but it didn’t go to Jobs because I had enough problems anyway. The other argument at the meetings was would Steve take his dirty feet and sandals off the table, because he sat at one end of the conference table, and Markkula sat at the other end chain smoking. So we had to have special filters in the attic in the ceiling to keep the room filter. I had the smokers on one side and the people with dirty feet on the other. That’s still the way it works, it’s still in the culture, you want to do things right, not just “good enough.” The alternative business model is like Microsoft, where something’s “good enough” to ship, instead of wanting it “just right.” It’s always been Apple’s goal to ship something we were proud of and something people would be proud to own, and I think that’s still true from thirty years ago. BI: Was there tension with you being brought in as, what we call now, “adult supervision.” Did you get the sense that he wanted to be in charge of the company and resented you or anything? MS: Steve just wants to be Steve. Steve’s never shy about telling you what he wants and where he stands. He’s very straightforward to deal with. Unlike other people that don’t tell you what they mean. With the thousands of pictures of Steve Jobs that are already present on the website, you might think that it’s impossible for me to find new ones apart from new Apple events and iAppearances of iSteve. But no (and frankly it continues to amaze me) — I sometimes stumble across never-seen-(by-me)-before pictures of Steve’s past, and it’s always refreshing. 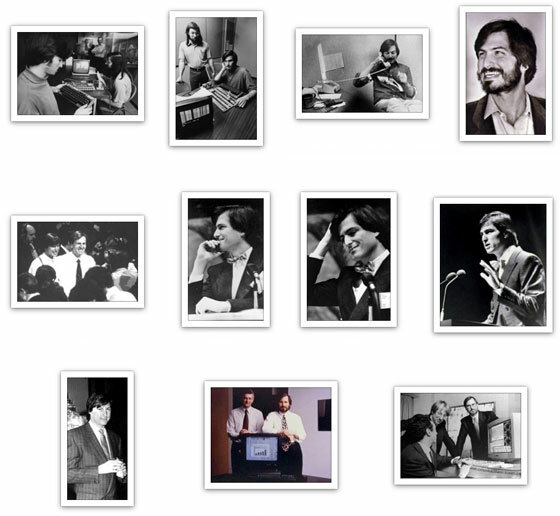 the first two pics are from the very early days of Apple, 1976. They’re of very fine quality, for once. the second to last is very interesting. I only had a cropped version of it. This is the only pic I’ve found of Steve with Peter Van Cuylenburg, who was brought in as COO of NeXT by investor Canon in 1992. He only stayed one year, as he betrayed Steve (even worse than Sculley) by calling up Sun’s Scott McNealy to have him buy NeXT and install him as CEO. It was a professionally fatal blow to Steve.